Easter Island (Polynesian: Rapa Nui ("Great Rapa"), Spanish: Isla de Pascua) is an island in the south Pacific Ocean belonging to Chile. Although located 3,515 km (2,185 miles) west of continental Chile, it is administratively a province (with just one "comuna") of the Chilean Valpara�so Region, together with its closest neighbour, Sala-y-Gomez, 400 km further East. The island is approximately triangular in shape, and is located at Template:Coor dm. The latitude is similar to that for the Chilean city of Copiap�, north of Santiago. The nearest inhabited land is Pitcairn Island, located 2,075 km (1,290 miles) to the west. The island has an area of 163.6 km² (63 sq. miles), and a population of 3,791 (2002 census), 3,304 of which live in its capital city Hanga Roa. The island is famous for its numerous moais, 400-year-old stone statues now located along the coastlines. Easter Island's human history began with the settlement of the island by Polynesians, who are likely to have arrived from the islands of Mangareva or Pitcairn to the west. The history of Easter Island can be related with the aid of a reconstructed king list of Easter Island, complete with events and approximate dates since the 5th century. These Polynesian settlers brought bananas, taro, sweet potato, sugarcane, and paper mulberry, as well as chickens. The island at one time supported a relatively advanced and complex civilization. The European discovery of the island, by the Dutch navigator Jakob Roggeveen, occurred in 1722 on Easter Sunday. Roggeveen found about 2,000-3,000 inhabitants on the island, but it appears that there were as many as 10,000-15,000 of them in the 16th and 17th centuries. The civilization of Easter Island had degenerated drastically during the 100 years before the arrival of the Dutch, owing to the overpopulation, deforestation and exploitation of the extremely isolated island with its limited natural resources. However, by the mid-19th century the population had recovered to about 4,000 inhabitants. Then in a mere 20 years, deportation to Peru and Chile and diseases brought by Westerners almost exterminated the whole population, with only 111 inhabitants left on the island in 1877. The island was annexed by Chile in 1888 (by Policarpo Toro). The native Rapanui have gradually recovered from their low of 111 inhabitants. Note that the name "Rapa Nui" is not the Rapanui's original name for the island. It was coined by labour immigrants from the original Rapa in the Bass Islands who likened it to their home island. The Rapanui name of Rapa Nui is Te pito o te henua ("Navel of the World") due to its isolation, but this too seems to be derived from another location, possibly a Marquesan landmark. Modern Easter Island has virtually no trees. The island once possessed a forest of palms, but it is thought that the native Easter Islanders completely deforested the island in the process of erecting their statues, as well as constructing fishing boats and buildings. There is evidence that the disappearance of the island's trees coincided with the collapse of the Easter Island civilization. Midden contents from that time period show a sudden drop in quantity of fish and bird bones as the islanders lost the means to construct fishing vessels and the birds lost their nesting sites. Chickens and rats became leading items of diet. There is also some evidence of cannibalism, from human remains. The small surviving population of Easter Island eventually developed new traditions to allot the few remaining resources. In the cult of the birdman (manutara), a competition was established in which every year a representative of each tribe, chosen by the leaders, would dive into the sea and swim across to Motu Nui, a nearby islet, to search for the first egg laid by a Sooty Tern during the season. The first swimmer to return with an egg would secure control of the island's resources for his tribe for the rest of the year. This tradition was still in existence at the time of first contact by Europeans. Easter Island, together with its closest neighbour, the tiny island of Sala-y-Gomez 400 km further East, is recognized by ecologists as a distinct ecoregion, called the Rapa Nui subtropical broadleaf forests. The original subtropical moist broadleaf forests are now gone, but paleobotanical studies of fossil pollen and tree molds left by lava flows indicate that the island was formerly forested, with a range of trees, shrubs, ferns, and grasses. A large palm, related to the Chilean wine palm (Jubaea chilensis) was one of the dominant trees, as was the toromiro tree (Sophora toromiro). The palm is now extinct, and the toromiro is extinct in the wild, and the island is presently covered almost entirely in grassland. Scientists at the Royal Botanic Gardens, Kew are reintroducing the toromiro to Easter Island. The large stone statues, or moai, for which Easter Island is world famous were carved at a later time than was initially thought. Archeologists now estimate that they were carved between 1600 and 1730, the last one being carved around the time when Jakob Roggeveen discovered the island. There are more than 600 large monolithic stone statues, called moai, on the island. Although often identified as "heads", the statues actually have complete torsos; many moai, however, have become buried up to their necks. Most were carved out of the rock at Rano Raraku. The quarry there seems to have been abandoned abruptly, with half-carved statues left in the rock. The most common theory is that the statues were carved by the Polynesian inhabitants (Rapanui) at a time when the island was largely planted with trees and resources were plentiful, supporting a population of 10,000-15,000 native Rapanui. The majority of the statues were still standing when Jakob Roggeveen arrived in 1722. Captain James Cook also saw many standing statues when he landed on the island in 1774. By the 19th century, all the statues had been toppled in internecine wars. There are tablets found on the island bearing a mysterious script. The script, known as Rongorongo, has never been deciphered despite the work of generations of linguists. A Hungarian scholar, Wilhelm or Guillaume de Hevesy, in 1932 called attention to the apparent similarities between some of the rongorongo characters of Easter Island and those of the prehistoric script of the Indus Valley in India, correlating dozens (at least 40) of the former with corresponding signs on seals from Mohenjo-daro. This correlation has been re-published in later books, for example by Z.A. Simon (1984: 95). Although later works have show all of this to be fanciful. Some with questionable authority say that "rongorongo" means peace-peace, and these texts record peace treaty documents, possibly between the long ears and the conquering short ears. Such explanations have, however, been strongly disputed, particularly as the "long-ear/short ear" designations are uncertain and unsupportable. Like most indigenous transmitters of Easter Island "histories," or "lengends," island "informats" continue to have questionable motives for their tellings. The Rapanu have always been creative and imaginative. Ask them a question, any question and they will respond instantly, with papal authority. That the Rapanui "invented" rongorongo cannot be disputed; its creative purpose and intent are as puzzling as the script's meaning. We simple do not know for sure and it would be disingenuous for anyone to posit fixed notions. There is slim chance that we will ever know what it means. While once the island of enigmas, there have been many many Easter Island mysteries solved, but these have been of the physical kind. Rongorongo's mysteries are of a different kind. While there have been many claims at translation, there has never been a time when two translators have agreed on method and meaning. This tells us what we don't wish to be told: there may be one Rapanui mystery that will never be solved. To date the most thorough study of rongorongo has been the work of S.R. Fischer; unfortunately his manum opus is far too costly for the average person. Population at the 2002 census was 3,791 inhabitants, up from 1,936 inhabitants in 1982. This tremendous increase in population is due mainly to the arrival of people of European descent from the mainland of Chile. Consequently, the island is losing its native Polynesian identity. In 1982 around 70% of the population were Rapanui (the native Polynesian inhabitants). At the 2002 census however, Rapanui were only 60% of the population of Easter Island. Chileans of European descent were 39% of the population, and the remaining 1% were Native American from mainland Chile. 3,304 of the 3,791 inhabitants of the island live in the town of Hanga Roa. Rapanui have also migrated out of the island. At the 2002 census there were 2,269 Rapanui living in Easter Island, while 2,378 Rapanui lived in the mainland of Chile (half of them in the metropolitan area of Santiago). Population density on Easter Island is only 23 inhabitants per km² (60 inh. per sq. mile), much lower than in the 17th century heyday of of the moai building when there were between 10,000 and 15,000 native Rapanui on the island. Population had already declined to only 2,000-3,000 inhabitants before the arrival of Europeans. In the 19th century, disease due to contacts with Europeans, as well as deportation of 2,000 Rapanui to work as slaves in Peru, and the forced departure of the remaining Rapanui to Chile, carried the population of Easter Island to the all time low of 111 inhabitants in 1877. Out of these 111 Rapanui, only 36 had descendants, and they are the ancestors of all the 2,269 Rapanui currently living on the island. 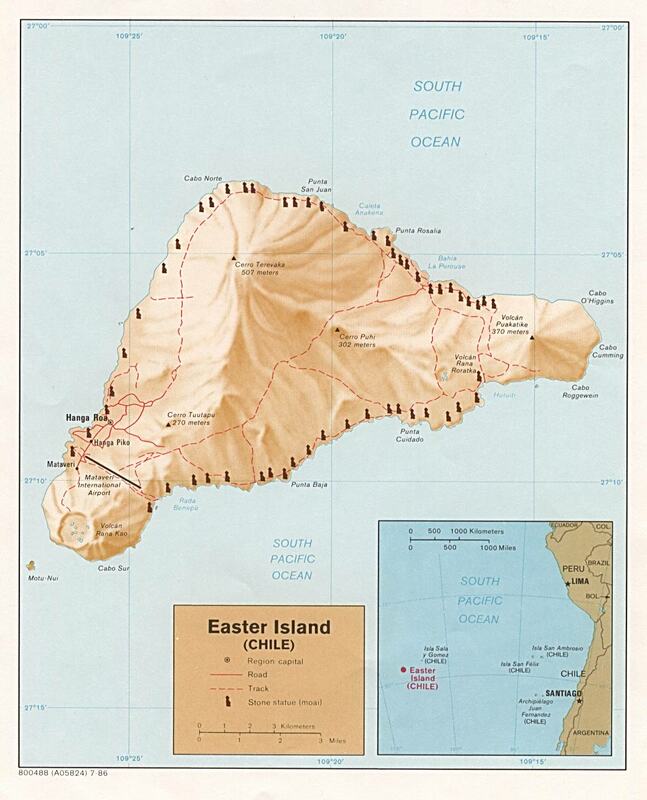 Map of Easter Island (http://www.lib.utexas.edu/maps/islands_oceans_poles/easterisland.jpg) from the Perry-Casta�eda Library Map Collection. Pictures of Easter Island (http://www.chmouel.com/geeklog/gallery/gallery_individual.php/polynesia/) from Chmouel Boudjnah photos travel's collection. Easter's End (http://dieoff.com/page145.htm) by Jared Diamond. Eastern Island - Myth (http://www.lost-civilizations.net/easter-island-eastern-island-myth.html) - story of HOTU MATUA. This page was last modified 01:01, 21 Jun 2005. This page has been accessed 13293 times.